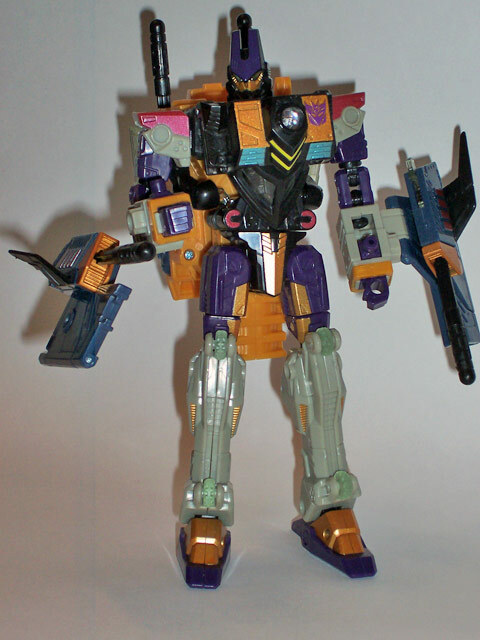 Tidal Wave has been reformatted into Mirage by Unicron, and he's far better off. He bends at the knees, now! He continues his alternate mode style of a sea faring vessel, but this time it's a much more realistic gunboat. All four missles can be triggered in both modes. This is a notch up from tidal wave, who could only store and fire his projectiles in his vehicle mode. Most of the detailing in this mode is around the bridge of the ship, which makes a lot more sense after he's transformed. His color is dominated by black in rear and the light blue used for the front of the ship. The forward missle launchers are mounted on a yellow piece. This becomes his back in robot mode, so that color is really only pronounced in the ship mode. The plates that form the front and sides of the ship help a lot in making it a streamlined, presentable vehicle. Since at the time of writing this Mirage hasn't seen wide distribution yet, I'll assume any you find will be in the box and with the instructions, so I'll wimp out of describing the transformation process in detail. However, the general process is that the rear of the ship forms his body, while the front of the ship forms the back and wings. 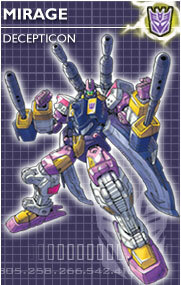 As a robot, mirage's colors are the traditional decepticon adornement: black, purple, and grey. All of his parts have molded patterns in them, and most are painted. The gold paint in the vents on his shins is a very subtle, but good example of the attention to detail. His head has the translucent, glowing eyes that Energon Starscream and Landmine have, as well. There have been some remarks that he resembles a G1 Scourge in both robot and vehicle modes. 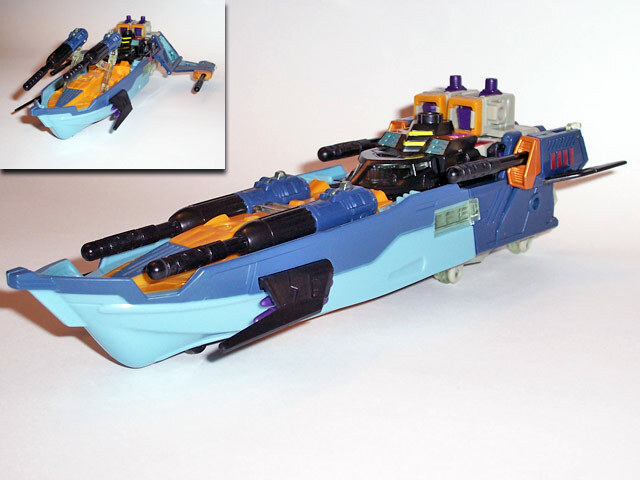 The boat homage I'll buy, but I think his robot mode is far more interesting than Scourge's. Mirage has 28 points of articulation in robot mode, and the especially pleasing part is that 20 of them are used in the transformation as well. That makes him a highly posable figure with a fairly complex transformation to boot. Some people have commented that the joints in his thighs pop off too easily, but that can be overcome simply by holding the upper thigh to move the whole leg, or the lower thigh to move the knee. Mirage also has a sound pack that uses AAA batteries which are not included, so I haven't even bothered with finding some to put in. Not having to take the batteries out is a plus mark in my book. Transformation: 7. Lots and lots of articulation joints are used for both the transformation and the robot mode. Durability: 5. Most of the parts that would break should gently pop off before something irreversible happens. Fun: 10. I like this bot a lot. Price: 8. He's one of, if not the, best figure I've gotten for the $20 price tag. It's still $20, though. Summary: 10. He's one of my favorites. All in all, he's one of the better transformers. He's very affordable (US$20), and is just, quite simply, a lot of fun.